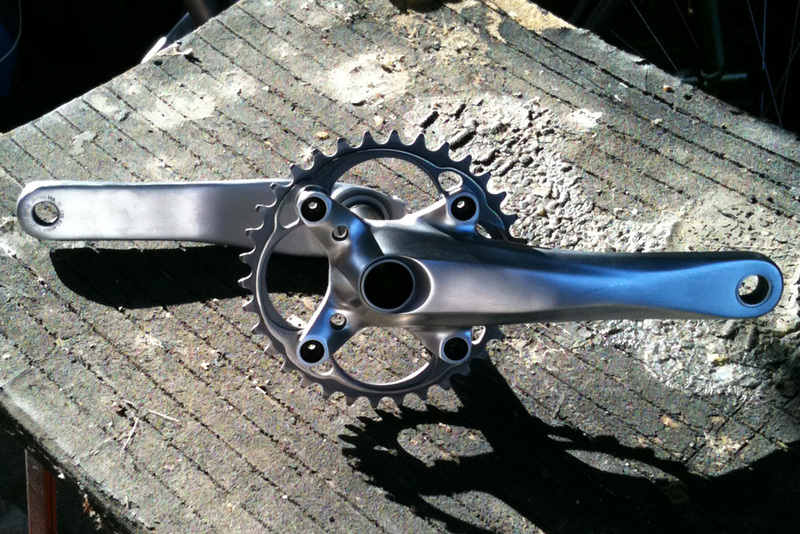 When I first saw a Jeff Jones modified XTR 960 crank I was stopped in my tracks. It was truly the most beautiful crank I had ever seen. Within a day I had modified my own 960's and ordered the Boone ring. Months went on with them saying soon, soon but in the end no additional rings were ever produced. 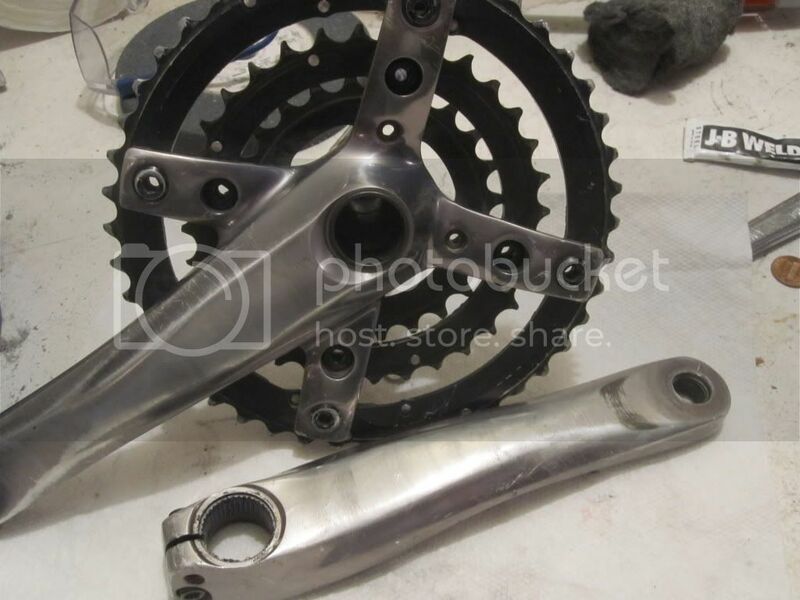 I searched and searched for the Boone XTR 960 SS chainring in this forum and others, on eBay and even emailing bike shops that carried Boone rings in the past but the 960 chainring has always been elusive (durning that time I did locate a Boone 952 Spider and and several cogs). 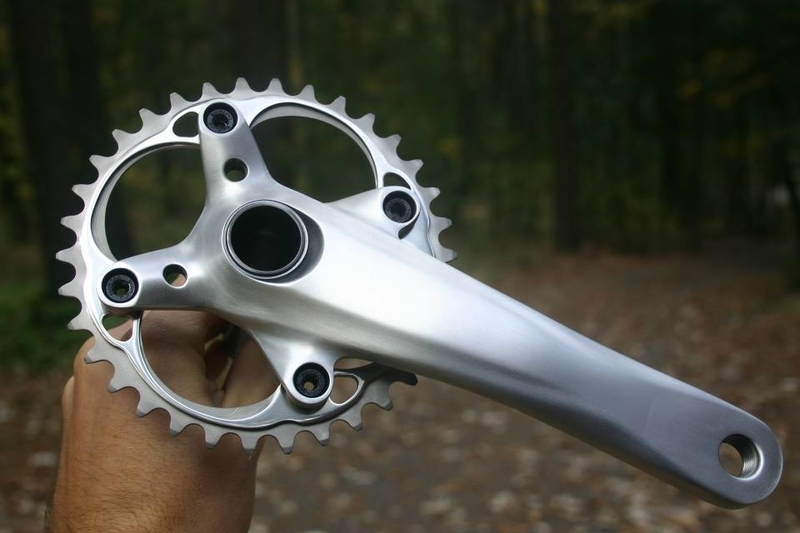 For a time I ran the OEM chainring and then at some point I switched to a Blackburn but they were never as cool as they could be with the Boone. Well last week that all changed. 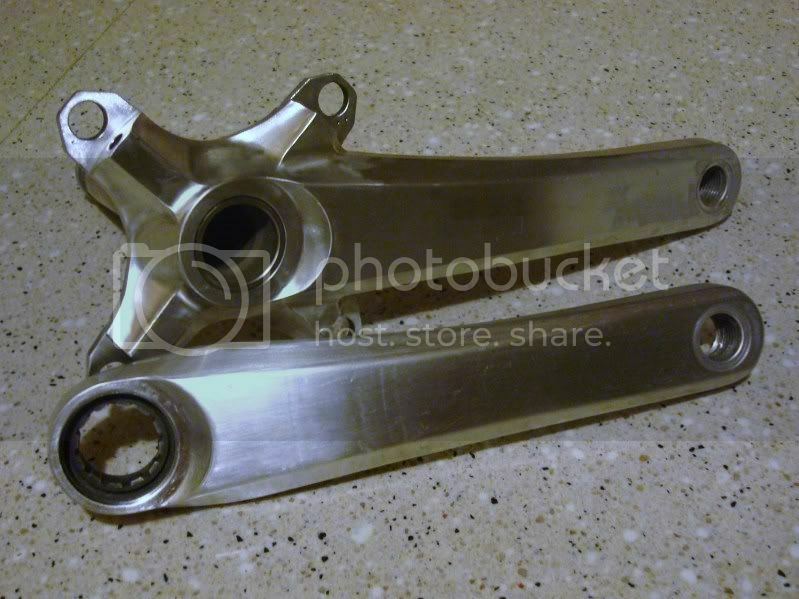 I dropped a good penny and won the only eBay auction I had ever seen for the Boone XRT 960 SS chainring. Today it arrived and within 5 minutes I had it installed and ready for the following picture. That is PURTY!!! If my Sweetwings ever give out on me I'm getting these. You got some nice $hit yourself! Don't you have 3 set's of Sweetwings? That does look mighty nice! Love my Crazy8 modded 960's!!! I followed that auction. Didn't even bother bidding as I knew it was going to get serious as the clock wound down. I've got a swanky one I may want to part with. I saw that auction as well but, I held off. 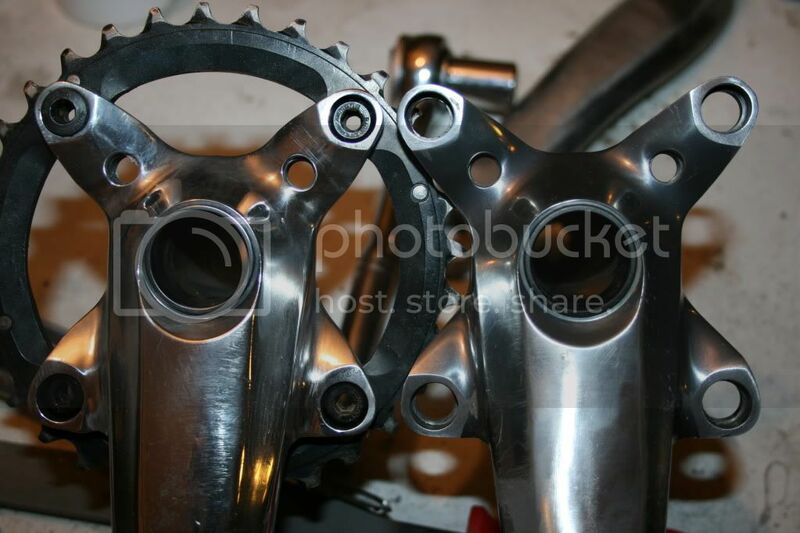 My Crazy8 crank and HBC ti ring should be here early next week for my air9 build. oooh you got one of those ti rings i sent RD, huh? I bought a used Rig for $700 w/ m960s (unhacked w/ outer bash ring) and a Boone-ti ring just like that. I bought it solely for the cranks and that ring and parted out the rest. I now have hacked, only half polished m960s in 180 and 175. Some day I'll get around to finishing up the arms. I saved the ring and 175s for my Mooto-X Slider that was en route. When I put it all together, I had maybe 1/16" between the ring and the chainstay, small enough that the ring would touch under certain conditions...not good. However, because they carve out the Ti from one side of the ring and the back side is flush, I was able to flip the ring and get enough clearance. So now I have flat Ti facing out, and the bling side facing in. Oh well. Probably should have just sold the ring on fleabay and got a ISAR or blackspire. I wish people would quit posting up 960's. Makes me want to chuck my SLX's to the curb. 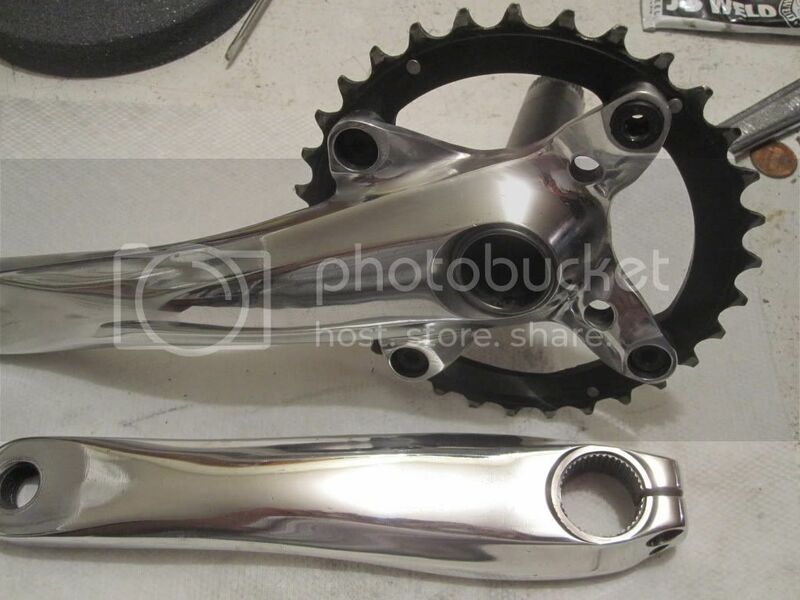 What does a polished SLX look like, I wonder? We'll never know, as SLX's aren't polish-worthy. Here's the poorman's polished version. I just did 2 of these. I haven't re finished the second but the first turned out ok and I think I did much better on the second. 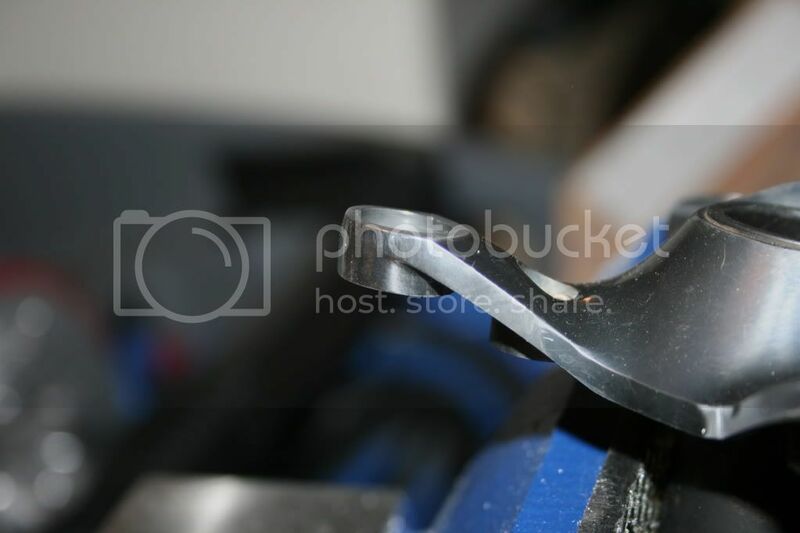 The key for me was to use a small ring spacer in the bolt hole to make sure the fileing was perfectly flat and even and then to use calipers to get the width of the arms perfectly balanced. good job. i tried that with my 970s but gave up after the first few hours of hand sanding... i got mine to a dull finish and i'm happy with it.